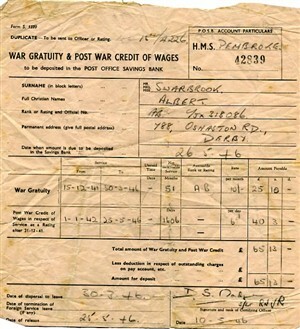 Born in November 1923, Albert (known as Bert) Swarbrook was only 18 when he volunteered for the Royal Navy "for the period of the present emergency" on 15 Dec 1941. 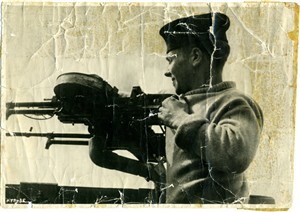 The photograph of Bert manning the Lewis Gun was taken during the shooting of the wartime film For Those in Peril. Produced by Michael Balcon,the film was made in 1944 at Ealing Studios and was the first film to be directed by Charles Crichton and photographed by Douggie Slocombe (although it was Ernie Palmer who photographed the interiors). For an entertaining description of the making of the film, follow this link which will take you to an interview with Charles Crichton, recorded in 1987 as part of the BECTU History Project. For Those in Peril tells the story of the men of Air Sea Rescue and is based on an original story by the late Ft. Lt. Richard Hilary (author of The Last Escape) who was killed on active service. The boat, on which Bert was serving at the time, RML 513, featured in the film. Bert was serving on RML 513 when it took part in the Dieppe raid, the raid in which so many Canadian soldiers lost their lives. 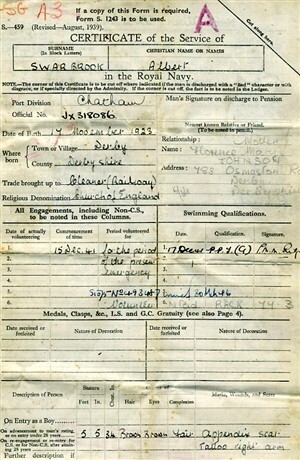 Bert served as Head Porter at Brighton College, Eastern Road. A position he held for 31 years before dying at the age of 69 in September 1993. This page was added on 23/03/2006. A great deal of the film was shot in and around Newhaven using the ASR boats which were based there. 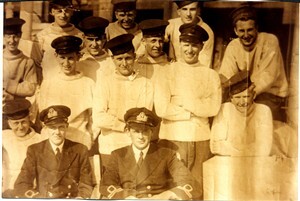 My father, Spencer Bates, was serving in the ASR (Air Sea Rescue) at the time of the Dieppe Raid, during which his launch HSL 123 was sunk by enemy aircraft. RML 513 in conjunction with HSL 177 and two spitfires drove off the enemy aircraft and rescued the survivors of HSLs 122 & 123.